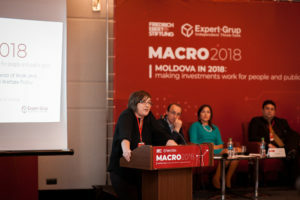 Moldovan policy experts and scientists met during the 6th MACRO conference 2018 in Chisinau on 19 October 2018 to discuss Moldova’s attractiveness for international investments. While public authorities, local businesses, and civil society discussed the role of private and public investment for the countrie’s economic development, the European Centre highlighted the need for social investments. Ms. Anette Scoppetta, Deputy Director of the European Centre, draw attention to the fact that investments aren’t supposed to be only about economic development, but about people. Social investments are core for any economy to grow.